What is this thing that changes our face from the inside out, from youthful hope into aging sadness? It is terrifying. 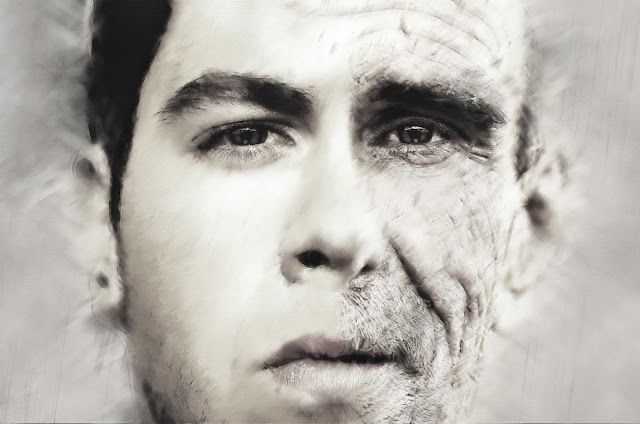 We all become something we hate; old. Pain and death await us in the bizarre reality of a world gone mad. We run from it, from the womb to the tomb, hoping to escape its grasp. We try to dull our fear with various vices and distractions, but it’s always there. We long for the comfort of love, but everywhere we turn, it evades us. We are born into an all-out battlefield; an unseen war that entraps us in its chaos. Slowly, we lose track of what we wanted to do and who we wanted to become. Out of nowhere, a ‘wound’ can send us into depression, anxiety, divorce, drugs, jail, or financial ruin. All the while, we are ‘on the clock’. Time has no mercy. They say “Smile. Pretend everything’s fine. Smirk and laugh. Everything’s a joke”. That’s true. But the joke’s on all of us, as time ticks by. Talley up the scorecard, my friend. With every year of your life that goes by, the world is winning. Its goal is to take all your years... and leave you with death. So much time wasted on stupid things you will later regret. How tragic if you never take the time to get alone and give your Creator God and Father His chance to answer your deepest cry. He loves you more than you can imagine. We are all born into this mess called sin. It makes us do, say, and become what we hate. God says “the wages of sin is death” (Rm.6:23,7:20). Yet no one ever talks about sin... or death... or hell. Jesus did, constantly. No greater love than to speak the truth. God provided the alternative to this mess and victory in this war by sending Jesus, not to start a “church” but to die our death, forgive our sin, and redeem our failures. On the cross, He shed His blood so He could save you and impart eternal life to you (Jn.11:25). Jesus rose from the dead and is a living Person, not a religious system (of people for you to impress for an hour on Sunday). What you need is to be real and find relationship, not with people, but with the living God. He calls you to come alone and believe in the living Jesus. I realized, no one else was coming to my rescue, or to make things clear. Jesus already did. His Holy Spirit can heal your worst nightmare into an extraordinary life (read the gospel of John). A prison sentence indicates the magnitude of a crime. The ‘lake of fire’ indicates the magnitude of sin (Rev.20:15). Mankind killed Jesus. God offers mercy now, but justice later. God says “it appointed to die once then comes judgment” (Heb.9:27). He loves you, my brother or sister. Call on Him. Gravediggers put Him under, but, unlike any other man in history, Jesus sat up and walked out of the grave and away from that cemetery. His command is to love others. How much longer will you live for yourself? Jesus is risen and promises eternal life. He says “You must be born from above” (John 3:7). He is coming soon. The time is so short, You must hurry.